The extension as a self-contained apartment on 2 floors with south-facing balcony to relax. On the ground floor is the kitchen with a sofa bed, so that three people can sleep. The apartment is equipped with Wi-Fi and satellite TV. Upstairs is the toilet with shower, and two bedrooms, each with a 1.40 m wide bed. On the property run around our four cats who like to be petted. The extension is built in 1965 and was completely modernized in 2005. 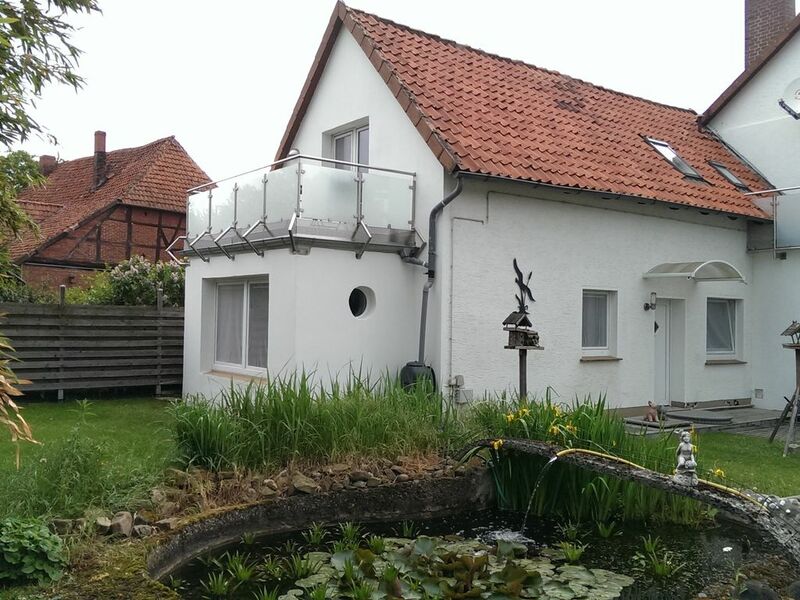 The property is located in a quiet side street on the outskirts Evestorf (place has 300 inhabitants) overlooking the Deister and surrounding fields. Fast traffic connections to Hannover via the federal highway 217 or public transport. Shops in the surrounding villages, the recreational area Deister is about 2.5 kilometers away and offers very beautiful hiking trails and destinations. A parking space is located on the property. Here is the unobstructable Deisterblick. The extension as a self-contained apartment on two floors with south-facing balcony to relax, for example, after a bike ride. On the ground floor is the kitchen with a sofa bed, so that three people can sleep. The upstairs two beds with a width of 140 cm each may also be suitable for 2 people, so if necessary, more than two people have space. Off the traffic route, it is very quiet here. The recreational area Deister is about 2.5 kilometers away and offers many hiking trails and destinations. For cyclists the Deister with its mountain bike trails is highly recommended. But bike rides in the surrounding communities, region or Hanover can be carried out directly via the bicycle routes connection. The center of Hanover can be reached by public transport or car in less than 30 minutes. In the yard of the property there is a lockable room where bicycles can be adjusted. Can also Blue Ray and is connected to the internet. If you bring your own account, you can also use streaming services. At the end of the stay please remove your account from the player. The Deister is a coveted destination for mountain bikers. The distance to Deister is about 2.5 kilometers.